Throughout her life, the Reverend Willie Taplin Barrow played an important role in many of the struggles for civil rights for Black Americans. As a child, she helped integrate school buses in her Texas hometown. She participated in the March on Washington, protested in Selma and organized alongside Dr. Martin Luther King Jr. in Chicago. She organized economic boycotts for food justice in Black neighborhoods and to support Black businesses. She worked to elect Chicago’s first Black mayor, and helped Jesse Jackson run for president while managing Operation Breadbasket. Rev. Barrow was committed to mentoring and investing in the next generation of leaders working for justice and equity. 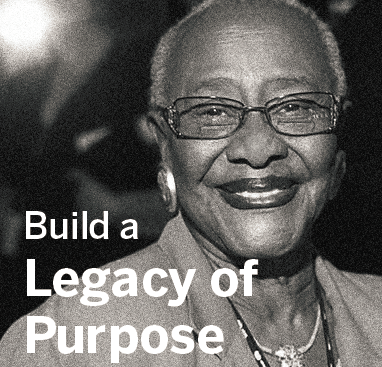 The Willie Taplin Barrow Fund for Black Women’s Leadership at CFW was created to continue that legacy. With the support of the Barrow Fund, we are thrilled to announce the inaugural Rev. 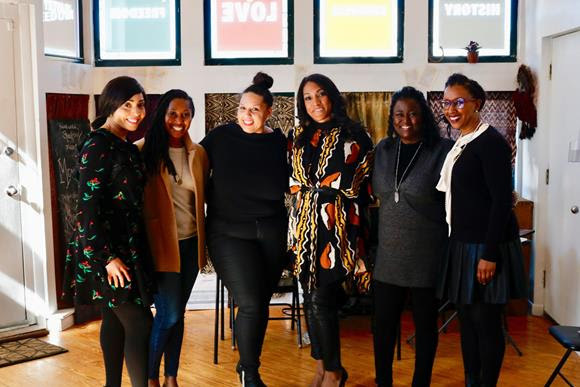 Willie Taplin Barrow Emerging Leaders Award with a $25,000 investment in Ladies of Virtue for their innovative work benefiting Black girls in the Chicago region. Ladies of Virtue is creating a powerful sisterhood of young Black women who are not just the leaders of tomorrow but already serving their communities as the leaders of today. The Barrow Emerging Leaders Award will support girl-led community initiatives, as well as career readiness and enhanced leadership development programming for Ladies of Virtue. CFW is delighted to present the Rev. Willie Taplin Barrow Emerging Leaders Award as part of the 2019 Impact Awards on Wednesday, March 27. I hope you’ll be there. 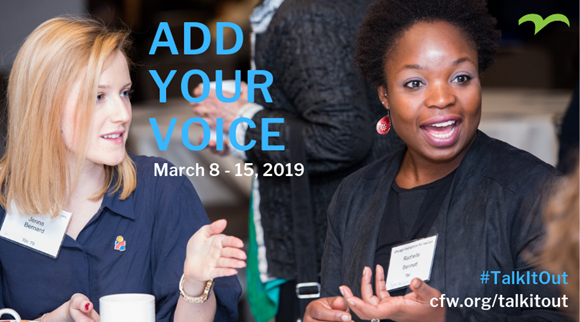 CFW announced today the fourth annual Talk It Out, a weeklong conversation series designed to spark understanding among women and men, girls and boys about gender bias. The series will kick off on March 8, 2019, International Women’s Day, and run through March 15. This year, Talk It Out will encourage thoughtful dialogue and discussion about what the end of bias and an equitable Chicago – for all its residents – would look like, and how the movement for gender equity can support and work alongside other movements for justice and equity. To learn more or to sign up to host a Talk It Out conversation, click here. Join CFW to celebrate the movers, shakers and impact makers working every day to improve the lives of women and girls in the Chicago region at the 2019 Impact Awards on Wednesday, March 27. 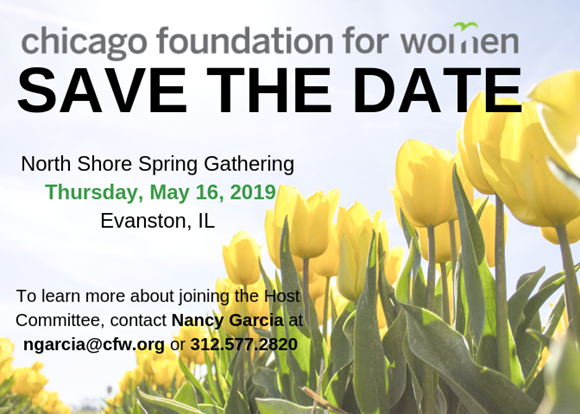 CFW is proud to honor Hedy Ratner with a 2019 Founders Award, Hoda Katebi with a 2019 Pioneer Award, and Inhe Choi, Dorri McWhorter and Reyna Ortiz with 2019 Impact Awards. CFW will also present the Rev. Willie Taplin Barrow Emerging Leaders Award to Ladies of Virtue. Click here for more information, including how to reserve your seat! 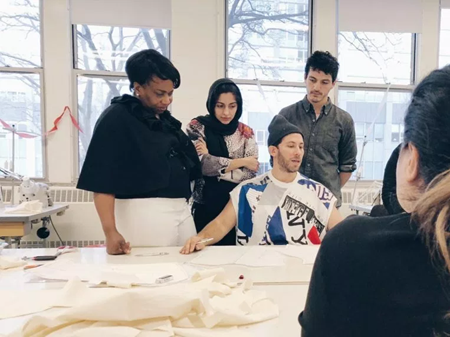 2019 Pioneer Award honoree Hoda Katebi recently launched Blue Tin Production, the first-ever fashion production co-op owned and operated by immigrant and refugee women. The co-op is co-founded by three women who came to the US from Nigeria and Syria, with Katebi as an honorary member. Read more about the co-op here. 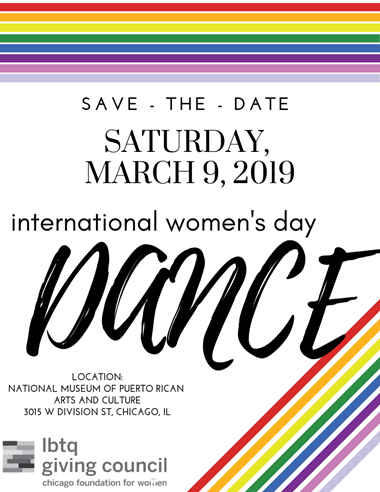 The LBTQ Giving Council of Chicago Foundation for Women is proud to host the 5th Annual International Women’s Day Dance! Come move to the beats of DJ Sandra Suave, and enjoy an open bar, light bites and other entertainment. To date the LBTQ Giving Council has mobilized resources to award close to $170,000 to LGBTQ folks in the community. Join us on March 9 to celebrate women-identified people, and help us raise additional funds to provide woman- and girl-identified people access to healthcare and information, freedom from violence and economic security! Early bird registration is available until February 22. Chicago Foundation for Women is looking for summer interns! Interested in fundraising and events? Apply to be a member of CFW’s Development team for the summer! Learn more and apply here. Do you love to write and live online? CFW is looking for a summer intern to help with marketing and communications. Learn more and apply here. The South Side Giving Circle is a great example of the “growth and increasing interest in giving circles that focus on racial and gender equity” taking place across the country, according to Inside Philanthropy. Giving groups like the South Side Giving Circle and the other giving councils and circles of CFW serve as entry points for new and emerging philanthropists looking to give back directly through community-led grantmaking. As a transplant to Chicago, Nicole Reed spent years looking for the best way to get involved in her adopted community. “In the Southside Giving Circle I have found a vehicle for my desire to make a positive impact on my new home and the lives of young women,” says Nicole. The South Side Giving Circle recently announced its very first round of grants, totaling $33,000 across five grantees. Read the full story here. 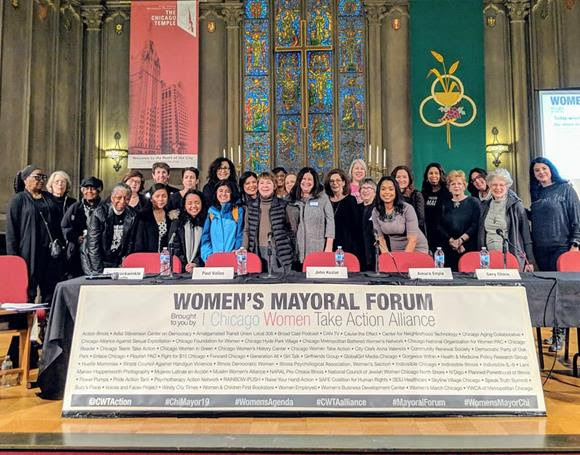 Over 50 community organizations hosted 11 of the 14 candidates for mayor at the February 3 Women’s Forum, with approximately 700 community members in attendance. The panels were moderated by MacArthur Foundation President Julia Stasch and Field Foundation President Angelique Power, who questioned the candidates on the issues of education, economic security and development, and community violence. You can watch the forum online here, and view the candidate questionnaire here. Planned Parenthood of Illinois (PPIL) President and CEO Jennifer Welch joined Vocalo in honor of the 46th anniversary of Roe v. Wade to discuss the future of the constitutional right to choose, PPIL’s 2019 initiatives “to protect and expand abortion access in Illinois,” increase services for incarcerated women and reduce maternal mortality. Welch also discussed Governor Pritzker’s recent vow to make Illinois the most progressive state in the nation when it comes to reproductive health. PPIL operates 18 health centers in the state and served more than 68,000 patients last year. Listen here. As people continue the work of holding R. Kelly accountable for allegations of abuse, the New York Times highlighted the women driving the work, including Cook County State’s Attorney Kim Foxx and CFW grantee partner A Long Walk Home. Read the full feature here. 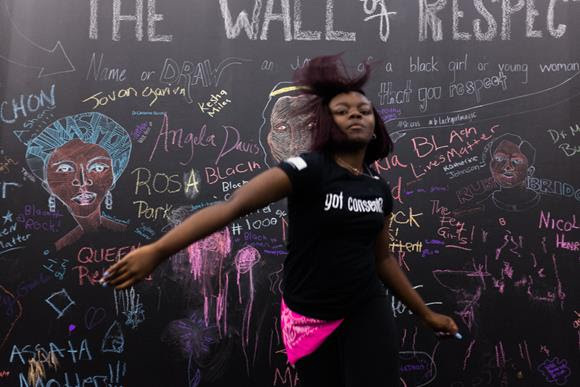 A Long Walk Home co-founders Salamishah Tillet and Scheherazade Tillet also published an op-ed in the Times calling on all of us to “to make sure that this current moment of listening to and believing black girls and young women is durable. If it’s fleeting, the#MeToo movement will fail.”Read the op-ed here. 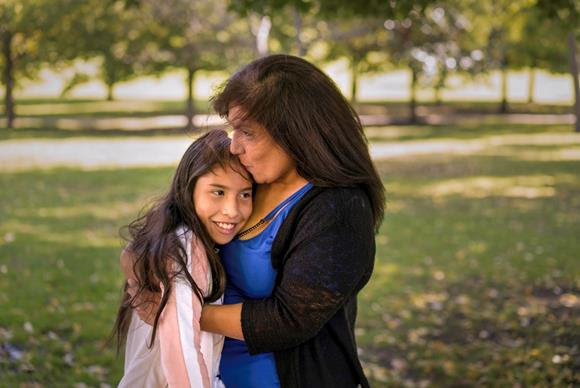 And for parents and adults working with young people, Leah Gipso from ALWH joined WBEZ to discuss how to talk to youth about sexual and violence and consent in the wake of constant headlines. Listen here. YWCA Metropolitan Chicago CEO Dorri McWhorter stopped by The Opening Bell at WGN to talk about how running the 140 year old social service agency like a startup has helped keep the company on track with its goals of eliminating racism and empowering women. “I take the best of what the business world has to offer, recognizing that we do have a social mission to fulfill,” says Dorri. Listen here. CFW joined women’s organizations across the country in asking members of Congress to co-sponsor and advocate for swift and thorough consideration of the Family And Medical Insurance Leave (FAMILY) Act. The FAMILY Act would create a national family and medical leave insurance program to help ensure that people who work can take the time they need to address serious health and caregiving needs. The FAMILY Act would help create more gender-equitable workplaces and homes, while supporting economic security for working families and caregivers. Read the full letter here. Media reports recently drew attention to a change in the description of violence used by the White House’s Office on Violence Against Women’s (OVW) website. According to the National Coalition Against Domestic Violence, “Before the change, the website described domestic violence as an advocate would, which includes verbal abuse, economic abuse and other forms of abuse that are common but may not be illegal. The website now references the statutory definition of domestic violence for Violence Against Women Act (VAWA) grant programs, which has remained essentially the same since VAWA was first passed in 1994. [And] operationally, the definition used in the grant-making process has not changed.” The Violence Against Women Act briefly expired during the government shutdown, freezing new grants, but has been extended until February 15.